The problem for the Su-35 is that its relatively massive radar cross section and loud radar emissions will make it a sitting duck for F-35s. With their sensor fusion capabilities, the F-35s probably wouldn't even need to turn on their radars. A big PESA will work well against other 4th gens but It would be a big liability against 5th gens and 4++ gens. Instead of being used to engage enemy fighters, the enemy fighters would use the radar emissions to engage the Su-35. Rafales at least have AESA radars, more advanced sensor fusion, a better electronic warfare suite and reduced RCS (albeit not VLO). They still wouldn't stand much of a chance against Israeli F-35s, but they would have better odds than the Su-35. Egypt doesn't really have other options. They could only afford the Rafale due to generous financing from France and they can't afford more. Relations with the USA are too strained to get advanced American fighter jets. So their only choice is to turn to Russia and maybe China. It's most telling that India isn't ordering more Su-30MKIs or really interested in the Su-35. They want Rafales, even though they cost a whole lot more. At the end of the day, you get what you pay for. If anybody told you they could get you a Ferrari for the price of a Hyundai, you would be skeptical. It's no different when it comes to fighters. Russia doesn't have some magical formula to produce superior aircraft at a lower price....especially when considering their low production volumes. icemaverick wrote: Rafales at least have AESA radars, more advanced sensor fusion, a better electronic warfare suite and reduced RCS (albeit not VLO). They still wouldn't stand much of a chance against Israeli F-35s, but they would have better odds than the Su-35. Egypt doesn't really have other options. Rafale AESA radar is one of weakest AESA so chance it would detect F-35 for any useful range is very slim. You have much better chance with Su-35 lot more powerful PESA radar in that scenario. And in future they will upgrade Su-35 with AESA so it would have even more powerful radar. Against non stealth Rafale is better option becuse it can use full potential of Meteor. Su-35 RCS isn't same as Su-27 RCS, I really don't understand why people think that. You can even find what Russians did with Su-35 to reduce its RCS. icemaverick wrote: It's most telling that India isn't ordering more Su-30MKIs or really interested in the Su-35. They want Rafales, even though they cost a whole lot more. India don't need more Flankers because they will have around 300 Su-30MKI. They don't need more heavies, they need plane which can replace Jaguar and MiG-27 so they need good strike platform and Rafale is excellent in that role. Problem is cost and political scandal connected to Rafale deal. Egypt has repeatedly sought to acquire high end air superiority fighters - namely the American F-15 Eagle. While these aircraft were sold to Saudi Arabia and Israel in large numbers however, Egypt was restricted to purchasing the cheaper and lighter jets such as the F-16 - ensuring a balance of power which favoured the Western Bloc’s more reliable clients. Furthermore, Egypt was the only major operator of the F-16 denied modern AIM-120 air to air missiles - meaning its aircraft would face an overwhelming disadvantage in combat with those of any other U.S. client. I talk about volume search. And there the range of the no35 is 200 km. Every Radar can do cued search. This is nothing special. And i assume a AESA can do this even better than a PESA or MSA. The Range of the RBE2 PESA is 140 km2 vs a 3m2 Traget. So add over 50 % and you have clearly more then 200 km2 range in volume search. And you know also, that a modern AESA is better under jamming conditions then a PESA. So the advantage of the RBE2 AA will be even bigger in a war scenario. As you can see here the AE has range of 12km as a surface to air missiles. Mica as 20 km. I think this says a lot. Mica has also a IIR seeker. That non Russian IR missiles has. Also a big advantage vs a stealth plane. swiss wrote: I talk about volume search. And there the range of the no35 is 200 km. 200km for typical airborne target which is 3m2 if you look other russian radar specification. Also don't forget one important thing AESA radars need lot more cooling and Rafale is smallish fighter so it probable cool its AESA using fuel, less fuel less cooling capability and it is questionable would it really be able to achieve 140km vs 3m2 constantly. On other hand Su-35 because of PESA and its size (enough space to have decent heat exchanger) can achieve 200km vs 3m2 constantly. And of course Su-35 isn't frozen in time it will get AESA upgrade. swiss wrote: As you can see here the AE has range of 12km as a surface to air missiles. A-A range are similar plus there is RVV-SD but as it is pointless becuase Rafale have Meteor which is better missile then any other medium AAM, but Meteor would be waste against VLO targets becuase of weak fighter radar. Mica-IR is nice but Rafale lacks powerful enough radar to use Mica-IR as BVR weapon against stealth. So Rafale will use Mica-IR in WVR and that is were Mica-IR isn't good as AIM-9X, IRIS-T, Python V or even R-74, because it lack TVC. Sorry Milosh, but this are the typical Russian Fanboys arguments. You have no prove for your statements. AESA are also more reliable the PESA Radars. And not the other way around. milosh wrote: A-A range are similar plus there is RVV-SD but as it is pointless becuase Rafale have Meteor which is better missile then any other medium AAM, but Meteor would be waste against VLO targets becuase of weak fighter radar. There is no official Range information from MBDA in A-A. Only surface to air. And there is a clearly range advantage for the Mica. France Air force say 100 km class missiles. So its very likely in the same ballpark then the SD. The mica has for sure TVC. And also Datalink, HOBS and LOL capabilities. She can even hit a target behind the Rafale, when guided from an other Rafale. So the mica is superior to every existing russian IR AAM. And in the same league then AIM-9x and iris-T.
We had this discussion so many times here. I don't no why you can't accept, that Russian aircraft and weapons are behind latest western 4 gen Fighters. So get over it and accept the facts. milosh wrote: Sorry Milosh, but this are the typical Russian Fanboys arguments. You have no prove for your statements. AESA are also more reliable the PESA Radars. And not the other way around. It isn't fanboism just numbers. If you have one radar which have 145km range for 3m2 and another which have 200km for same target (you can check NIIP to see what is étalon target is). I don't say PESA is better of course it is not but AESA doesn't automatically mean better range. After all Russians are developing AESA and plan to upgrade PESA Flankers with it at least Su-35 becuase I don't know how easy would be to replace N011M with AESA, it is lot older radar (based on N007 tech I think). About missiles I really doubt mica which is only little heavier then AIM-9 can be 100km class missile but it really don't mean much if Rafale will detect F-35 only from close distance. On other hand Rafale with meteor and mica is deadlier for 4gen fighters then Su-35. A "weak" AESA is still superior to a PESA. The likelihood that an Su-35 will detect an F-35 at any useful range is even slimmer than a Rafale's chances. In fact, its PESA radar will allow the F-35s to send in AMRAAMs without even turning on their radar. 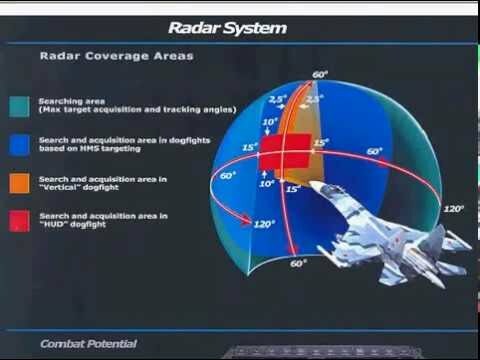 The Su-35 also has a massive radar cross section, so it will be spotted by Israeli AWACS or ground-based radar. Also, it's a lot easier to jam a PESA radar. The Rafale has the Meteor, which is a superior missile against both stealthy and non-stealthy targets. It also has superior sensor fusion and network centric warfare capabilities compared to the Su-35. That would give it a better chance of engaging F-35s. But even the Rafale's chances aren't great. The Su-35 has some RCS reduction measures but you're not going to reduce the RCS by the orders of magnitude necessary to make a major difference. Stealth cannot be "bolted on" after the fact. It has to be baked in to the basic design. The Rafale is not anything close VLO but it did incorporate RCS reduction measures into the design from the very beginning. The Flanker family, on the other hand, had zero RCS reduction measures when first designed. A few minor changes here and there aren't going to make a major difference....especially against advanced modern radars. If the Su-57 is being rejected by India due to its weak stealth, I highly doubt that the Su-35 has anything resembling a decent RCS in the modern world. It certainly has a larger RCS than the Super Hornet, Typhoon, Rafale, Gripen and F-35. It probably has a larger RCS than the F-16 as well. Most likely its RCS is comparable to the F-15 at best. However, the latest F-16s and F-15s have superior sensors and missiles. It's still far cheaper than the Rafale. Even if India doesn't need a "heavy" fighter, they could still afford way more Su-30MKIs than they could Rafales. Yet, they are willing to pay significantly more for Rafales. They must believe that there is a major advantage, otherwise they would never have bought the Rafale in the first place. The Russian GDP is still smaller than of Italy. Their research and development budget is still very small compared to their Western competitors. While Russians can build decent airframes, their engines, avionics and missiles are inferior to Western offerings. icemaverick wrote: Most likely its RCS is comparable to the F-15 at best. There is detailed report if you want I could look for it. Su-27 is comparable to F-15, Su-35 have lot smaller RCS it is similar to average F-16. While it isn't good as Rafale it isn't massive as folks think. But problem with Rafale are fuel tanks. Su-35 don't need them at all, while Rafale have them during combat missions. So I am pretty sure early warning radars will detect Su-35 later then Rafale with tanks. Well it wasn't lot cheaper last batches cost a lot, over 100 million dollars per plane. Of course part of higher cost is domestic manufacturing and option for AESA upgrade for whole Su-30MKI fleet but still it wasn't cheap as first batches India bought. Su-30 is lot worse as multirole and if you look what was most important for Indian MRCA competition it was multirole capability. Typhoon for example scored better in A-A but lacked in A-G compared to Rafale. I really don't want to continue arguing about radars you have numbers it is clear which radar have better range. milosh wrote: I really don't want to continue arguing about radars you have numbers it is clear which radar have better range. Which is RBE2 AESA; RBE2 PESA is 140 km vs 3 m^2 RCS, and the AESA version is claimed to have at least 50% better range, which gives it 210 km vs 3 m^2 RCS. No35 is only 200 km vs 3 m^2 RCS. Factor in jamming and the AESA is even more superior. The more information the better. 2 to 3 sq m is generally the figure I have seen for the Su-35 with its exposed inlets which the Rafale should beat even with stores head-on. Both will not be stealthy side on. Their radars should be comparable (bigger PESA antenna Vs smaller AESA) as would be their IRSTs. Load Rafale up with 3 big tanks and the ranges would be similar. Meteor/Mica are better than Su-35 missiles. The Egyptians were vetoed SCALP cruise missiles for their Rafales by the US so I suspect it's the offensive armament of Su-35 they are really interested in coupled with its range. And Thales even says, its clearly over 50%. What percentage increases over PESA will the radar offer in terms of search and tracking ranges? In terms of performance, detection range is increased by considerably more than 50% and the radar can look in many directions at the same time offering significantly enhanced tracking capabilities. I do not know what is so difficult to understand. That is not the RCS plot of the Su-35 but a theoretical example of what RCS reduction on a Su-27 would look like. marsavian wrote: That is not the RCS plot of the Su-35 but a theoretical example of what RCS reduction on a Su-27 would look like. OK, but we're talking about a "clean" SU-27 and "clean" SU-35 here, correct? What happens when you hang the much vaunted capability of 10-12 AAM's off an SU-35? Or even 6?? Some of those missiles have some BIG honking control fins (like the R-27).What's the RCS look like then??? Yes you are right. But this is what the Su-35 is. A Su-27 with ram coating at the airframe and canopy. Or do you now any other version of the Su-27 in service with ram? The study is from 2003. A view years bevor the first flight of the Su-35. Definitely more Drag and RCS increase than modern western Missiles. This is probably also the reason, why you see Su-35/30 only with 4 missiles in combat mission over Syria. Western missiles have a frontal RCS of well under 0.1m2. So difficult to say what the R-77, R-27 or R-73 have.